On Sunday, December 9th, 440 children lit up the atrium of Legacy Emanuel Hospital with huge smiles. 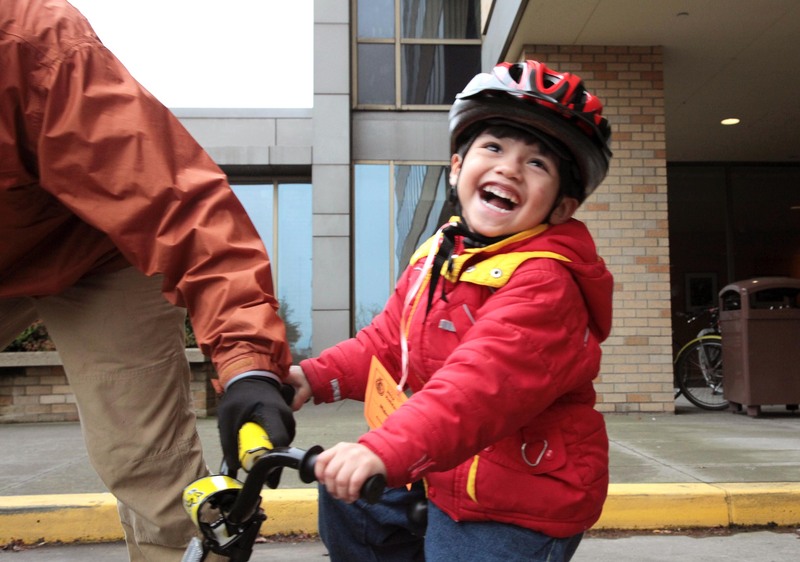 Before choosing their new bikes, they learned how to be safe on the road, how to safely fit and snap on their new helmets, and many other hands-on lessons designed to make bike safety accessible and engaging. The Holiday Bike Drive is the culmination of a year of work by over 500 volunteers who dedicated more than 7,000 hours to clean and refurbish bicycles donated by our generous community of supporters. What made this year’s Holiday Bike Drive so special were the familiar faces at the event. 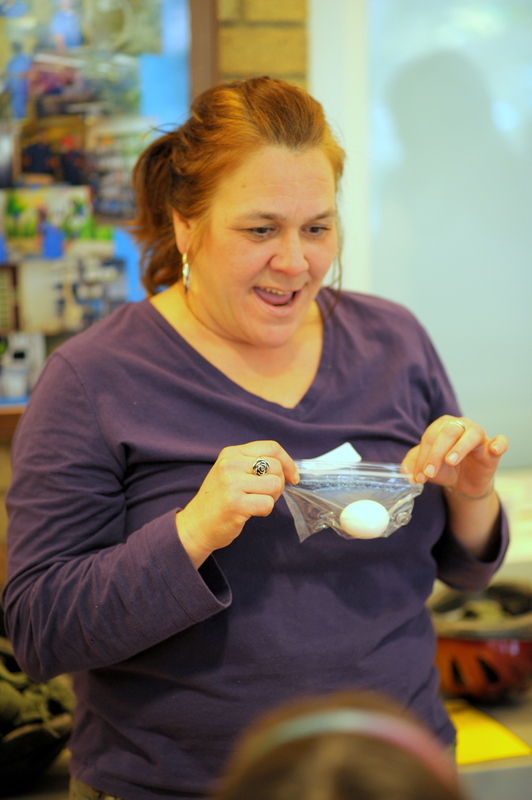 In the safety education hallway, Michelle Hanna, a Community Bike Educator from New Columbia’s We All Can Ride committee, spent the day teaching families about the importance of protecting heads at the helmet egg drop station. A former Create a Commuter participant, Michelle is a wonderful example of how program participants can become leaders in their community, demonstrating why providing access to bicycles isn’t a gift, it’s an investment. Lourdes Montes and Wendy Yah Canul from Hacienda’s ABC committee earned bikes last week through Create a Commuter. 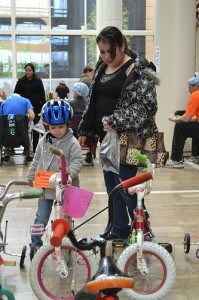 On Sunday they brought their children to the Holiday Bike Drive to choose their first bicycles. Both women are excited to be able to ride with their kids, and have even started practicing their routes to school. Come spring and summer, ABC will be leading rides in Cully — broadening the bicycle movement in their neighborhood. We are so grateful to the dedicated community of volunteers and donors that make our work possible. We would especially like to thank Mike Morrison and Trauma Nurses Talk Tough for donating all of the helmets, and Legacy Emanuel Hospital for being such gracious hosts. We would like to thank our event sponsors: Cyclone Bicycle Supply, Wilson Construction, Old Spaghetti Factory, Trauma Nurses Talk Tough, and Legacy Emanuel Hospital. We received additional in-kind support from Nossa Familia Coffee, Russell Street BBQ, Tin Shed, Great Harvest, Whole Foods, Organics to You, and Dave’s Killer Bread. It’s not too late to make a gift to the Community Cycling Center’s winter fundraising campaign. Our goal is to raise $130,000 by the end of the year and so far we’ve reached the $50,000 mark. Please consider making a gift this fall to help us continue to make bicycle dreams come true in 2013.